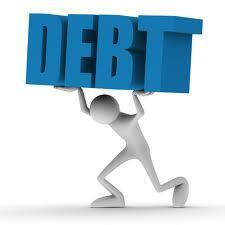 One of the most difficult conversations I have with my clients usually involves how to get out of debt. Jane Doe owns a home, and a friend recommended she speak to me. Her daughter was getting married, and she didn't know what to do. She had over $20,000 in credit card debit and figured she could tap her home for the last bit of equity in it, and use the funds for her daughters wedding. I know what you're thinking... she's a spendaholic. Actually, she's not. She got married young to a deadbeat Dad who hasn't paid child support in over 15 years. She raised her two daughters alone as a single parent in an incredibly high cost of living area. Not to mention, she did all of this on a teacher's salary. Between 5 credit card bills, her mortgage, and the essentials, she had less than $50 of disposable income. I really wanted to help her, possibly by consolidating her high interest credit cards into a low interest Home Equity Line of Credit, but her debt-to-income ratio was too high. With tears quickly building in her eyes, I scrambled to calm her down. "I'd like to help you." I said. "Will you listen to everything I say and do your best to stick to a plan I give you? I will be calling you once a week to discuss your progress, and would like your full commitment prior getting started." So I began reviewing her finances, and remembered a Dave Ramsey theory that getting out of debt is 20% head knowledge, and 80% behavior. I know conventional wisdom tells us to pay off higher interest credit first, but what about getting some MOMENTUM! I firmly believe his snowball tactic is a good one, and will recommend it to my readers as well. 1. List all of your (non-home) debt on a piece of paper in order from smallest balance owed to largest. 2. Pay the monthly minimum on all debt until you have $1000 in an emergency savings account. Do not touch this. 3. Pay the minimum on all debt besides your smallest balance. Pay the maximum you can afford on this, and do so with "gazelle-like" intensity as Dave Ramsey would say. 4. Do your best to keep expenses low. Ramen isn't healthy, so I don't recommend it, but Costco and sandwiches will feed you very inexpensively. I'd suggest you try that. 5. Once you pay off one of your credit card balances or loans, save the last statement and display it somewhere you'll see it everyday. I can't say enough about the positive impact the feeling of "making progess" can have on a plan to eliminate debt. 6. Take the same payment (+minimum from next largest liability) and apply it to the next largest balance. 7. Continue this process (and be sure to display the paid off loan balances on your fridge or bathroom mirror) until all balances are paid off. 8. Take a sigh of relief and pat yourself on the back. You did it! It is very easy to feel discouraged when you are up to your ears in debt. I truly sympathize for clients like Jane Doe, even more so because she got there in large part by doing her best to provide for her children in less than ideal circumstances. Getting out of debt is a concious decision. It must involve a lifestyle change. I applaud you for reading this article if your circumstances are similar to Jane's, and thank you for sharing with friends in debt if you feel this would be helpful to them. Please leave a comment if you have any questions! Dave Ramsey gives good advice, but his tips on investing are pretty bogus, thanks for this post and your other good ones on index investing! I admire Jane's strength and perseverance to overcome such a hurdle in her life. Giving her the best advice and checking her progress on a weekly basis is just admirable, Charles. I commend your willingness to help. Recovering from a financial hole isn't easy. Sacrificing a lot of stuff and saying no to unnecessary spending is must for everyone. How's Jane now? I hope she was able to recover. Thanks for sharing! “...20% head knowledge, and 80% behavior” - I could not agree more! All it takes is discipline and courage to get yourself out of debt. Financial consultants can help you, only if you will help yourself too. Thank you for a great share! Allan Morais @Paddon + Yorke Inc.
Great blog! I found your post on a bogleheads thread and will continue to read through your material. I would like an update on what the mother did or did not do for her daughter's wedding. I would like to hope that Jane Doe focused on taking care of herself first and foremost and left the wedding planning to her daughter. Weddings don't have to be expensive. When me and my wife were in debt, we went to city hall, paid $55 for the wedding ceremony, $65 for the marriage license, and $17 for the marriage certificate... then called it a day. We did a larger ceremony in the future after we paid off all of our debts (except mortgage) and saved up for our wedding.